Jon here for the Marketing for Owners Podcast, giving you another tip on how to build your business, – make it easier, make your life easier, better quality customers, and make more profits. Who doesn’t want some of that? And by the way, when I teach or show these tips, it also teaches me. Much of it comes from my experience and what works for me. But by telling you about it, it helps me look back at my work and think, “Oh! Am I doing enough of what I actually preach?” by the way, I do practice what I preach, and I will never actually tell you anything that I don’t use myself. So what’s all about these questions and content? Well , listeners are always wondering, “What can we write about? What content? What can we put in our social media? What can we write about on our blog, our websites, how can we talk to customers?” etcetera, etcetera. But the secret in modern marketing is that the control has shifted from the supplier to the consumer. Now that is the main difference of the modern age. In the old days– say for instance, in my business in fire extinguishers, the way you’d find out of what fire extinguishers, or fire safety equipment you need is by having someone come to you and tell you what you need. The expert, they will say, “You need this. These are the rules. You wouldn’t know anything.” they don’t give you any information that sounds very convincing. They give you a price, you buy it, and that’s that! These days, when a guy comes along, he tells you what you need, and the customers say, “Okay, leave it with me. I’ll look it up.” He goes– he tries sales tactics, it doesn’t work, customers are not doing that anymore. As soon as he goes, they bring out Google, they enter in the items that he’s quoted and they look up how much it costs. The next thing is they look up, and start asking — are those the things they actually need? Yes! It’s all changed! The consumer is in control because they then look up that company, they look up for ratings, they look up the social media and they find out, are they trust worthy? They are in control. They can ask their friends and their colleagues, “What would you do?” because it’s easier to send a Tweet, a direct message. They can– anything! They can Snapchat a friend. It’s all different. So, we need to get in the customer’s language and we need to get into their heads and we need to provide the answers for the questions that are in their heads. So, how do we do that? We do it with questions. What questions do customers ask all the time about your products? For example, fire extinguishers. The common question we would get is, “How many fire extinguishers do I need in my office?” We would say, “How big is your office? What have you got? etcetera.” but that’s what they want to know, and that’s the kind of thing they would enter into Google. Something like, “How many fire extinguishers do I need for an office?”, and they’d expect an answer. That is what’s on their mind. So if you have content that matches their questions, then you’re going to get the click. Now, this can apply in meetings, in everything. Every touch point for the customer, ask them questions, don’t tell , ask. So, if you ask a question of the customer to get into their mind, you will get the answers back from them in their language. So if you say, for instance, the customer wants to know how many extinguishers. “How large is your office? What type of equipment do you have? Do you have any fire safety equipment at the moment? And have you had fire safety equipment before?” when they answer you, then we’ll start in to get into a conversation. This is pretty standard stuff, but you find they use certain types of language to describe that fire safety equipment and describe their office. And now, when you answer, you can use their language. If you use their types of words, it means more—it’s more relevant, it helps. This can work in any form. So, in written content, in conversations on the phone, in face to face, in workshops, if you ever have a workshop or if you give training, ask people. Ask them to join in. If they give you the word and this kind of language you can use in your content and in your social media because you’re now talking customers’ language instead of suppliers’ language and it’s all more relevant. You’re going to get more likeable. 1. Grab your pen and paper and write down 10 questions. I want you to write down 10 questions that your customers ask on a regular basis about anything they ask to do with your products or services, or your business. 2. Go to a friend outside of your business and ask 10 more questions. The next one, this is trickier, I want you to go to somebody else. It could be preferably not your spouse, however, if you’re lazy, your spouse. But somebody, a friend, a mate, perhaps even someone else at work -, but preferably someone from outside the business who’s a good friend and say, “Hi you know what I do for a living. I do this and that. If you were a customer of mine, give me 10 questions you’d ask. Just ask me anything about my business; I want to write them down.” Get those 10 questions from the outsider. Okay, they are going to look very, very, very different to yours. 3. 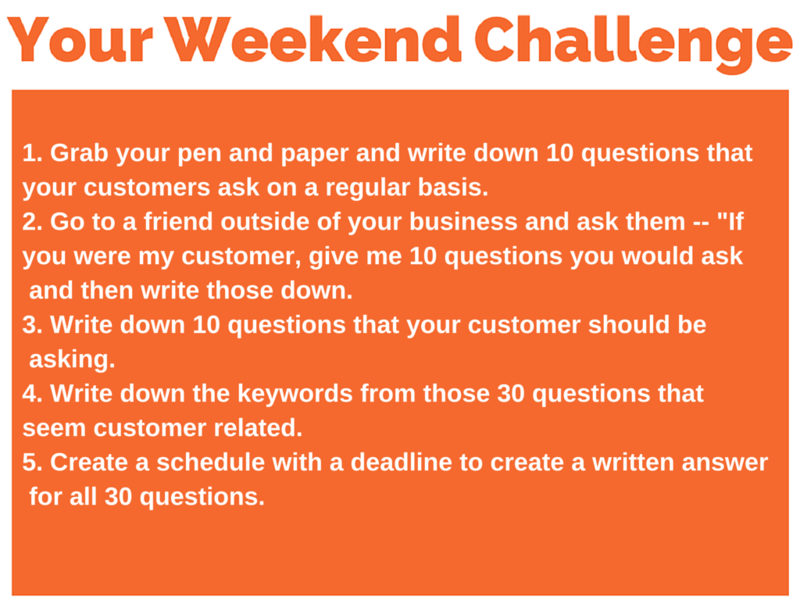 Write down 10 questions your customer should be asking. Yes — that is 10 more questions, but don’t worry — this is the weekend, you’ve got 48 hours to do it and so don’t you worry. 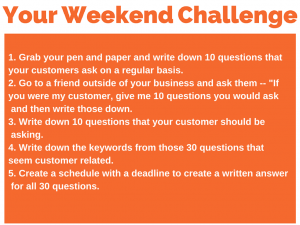 I want you to write down because you’ve written down the 10 questions that people ask, I want you to write down ten questions that customers should ask. So for example, in the fire extinguisher business for instance, people ask us, “How much does it cost to have a fire extinguisher service?” what they should ask is, “How much are the costs to have a fire extinguisher service over a 5 year period or over its lifetime?” because they don’t know the cost will go up, we do, and that’s what they should ask. 4. Now pick out certain keywords that are customer related. Nowbat the end of this, you have 30 questions from the outside s0 — you are going to pick out certain words and terminology that are different to yours. Ones that seem “customer” type of words. Write those down. You are going to design a schedule with a deadline to create a written answer for all 30 questions. Now, don’t forget, that’s 30 pieces of content. If you’re going to do one a week, that’s 30 weeks! This is not something you’re going to do next week! I assume you have a content writer, or you write, or you do something. But those can be used in e-mails to customers. Those can be used in content on your blog. This can be used to post on Facebook. Of course you could record a podcast, you can record a video giving the answer. If you do a video, you could then have that transcribe and make that into a post. That can then go on to LinkedIn. You could make an audio download. You could make a check list of the answers. You can re-purpose. See? How many bits of content can you get out of that? Lots! So you don’t have to write these all today, but there is your content for the next 30 weeks or so. Pretty cool, eh? You can do this exercise over and over. That’s all you ever need to know! So next time, ask your staff, – each of them. Write down 10 common questions. White down 10 questions they should ask. So if you have 5 staff, – that’s 10 questions customers ask and 10 questions customers should ask -, that’s 20 each times 5, that’s 100! Don’t ever tell me you don’t have any ideas for content. 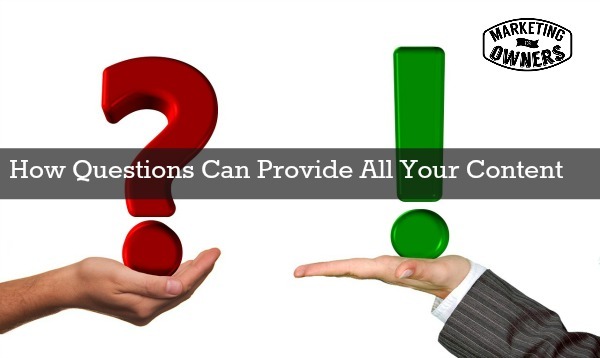 Answering those questions is answering your customers’ needs. That’s what they want. Next week is going to be fabulous! But I know that you’re going to be busy this weekend, so let you get up. I hope it’s sunny for you! Have a great weekend! How many questions can you come up with?